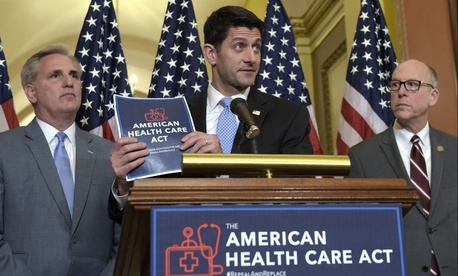 On a policy level, that may hold merit, as the bill to replace the Affordable Care Act aims to reduce the conditions health insurance providers must meet when offering plans to customers. No one should expect, however, the legislation to actually reduce the size of the bureaucracy, according to experts in federal health policy operations. It is true the Health and Human Service Department has taken on new responsibilities since Obamacare was passed and implemented, as well as new workers to carry them out; during the Obama administration HHS grew to more than 86,000 employees, up 14 percent from the waning months of George W. Bush’s presidency. Much of the new work -- and workers -- fell to HHS’ Centers for Medicare and Medicaid Services -- which has seen its workforce skyrocket 42 percent to 6,300 workers since the end of fiscal 2008. As Republicans look to finally follow through on a promise to roll back much of the ACA, there will not likely be a corresponding decline in federal personnel. “If I were a career employee at CMS would I be sitting around worried? No probably not,” said Thomas Scully, former CMS director under Bush. More likely to feel the brunt of change, he explained, are the roughly 60,000 contractors who actually administer Medicare and Medicaid on a daily basis as Republicans shift the programs more toward managed care. Components such as the Center for Consumer Information and Insurance Oversight -- which works with states and stakeholders in creating and overseeing exchanges -- and the Center for Medicare and Medicaid Innovation could see their responsibilities reduced, but Scully said it would make more sense for those entities to retrain and reassign those employees than to lay them off. “People will be moved around,” he said -- in part due to ongoing shortages. Despite the recent hiring uptick, Scully explained, CMS could use more employees, not fewer. “Even for a cheap Republican like me it’s hard to say it’s not understaffed,” he said. A senior Obama administration official who worked on health care policy agreed, saying there would not be major workforce changes at HHS like those starting in 2010. Existing staff, the former official said, would be redirected for the new set of policies. While the staffing levels would likely not alter dramatically, their work would change. The former official predicted forthcoming challenges would stem from management finding ways to redirect existing resources rather than making wholesale changes akin to those that occurred under Obama. In addition to CMS’ work on exchange and insurance oversight, the Republican plan would likely chart a new course for the Substance Abuse and Mental Health Services Administration, the offices of the Assistant Secretary of Health (which oversees health and science investments) and Planning and Evaluation (HHS’ policy and economic analysis shop). The budgeteers in Secretary Tom Price’s office could all expect new tasks. In addition to HHS, the departments of Treasury and Labor, which both worked hand-in-hand with HHS to issue guidance to implement ACA, could also face a new workload. While the new Republican bill would cause some shifts in focus and direction, it would not -- unlike Obamacare -- create whole new components or functions. Employees may feel dispirited by the new direction of the department, the former Obama official said. A lot of workers came on board because they believed in the mission of the ACA and have spent years building the department up to where it is today. Scully, however, did not predict a mass exodus of those employees, at least not at his former agency.